Are you ready for this? 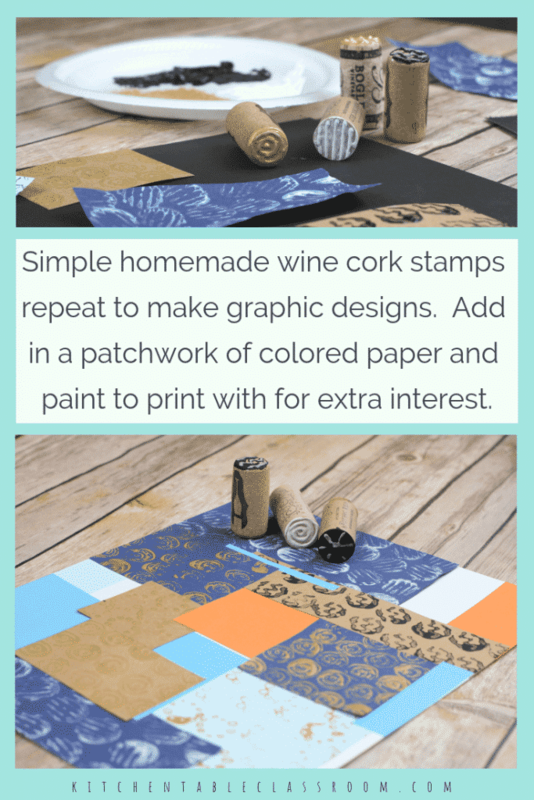 You’ll need one cork for each stamp you want to make. If you don’t love a glass of red before bed at night as much as I do you can buy corks on Amazon, where you can buy literally anything! If I had to guess you know someone that has a cork or five floating around in the junk drawer. You’ll be creating the raised portion of the stamps from puffy paint. The color doesn’t matter here we just want the raised pattern that it will create. This is a great place to use up any odd colors or leftover puffy paint from another project. You’ll need paint with which to create the stamps or prints after they are dry. We used craft acrylic because it’s cheap and comes in awesome colors but it is permanent. If you’re looking for washable paint try tempera paint! We upcycled real corks from wine. Some were natural cork and others were a more manmade, plastic-y kind of material. Both work for this stamp making process. Turn the cork over and look at both sides. It’s important to choose the smoothest side to make your stamp on. Most of ours had been pierced on side or the other by the bottle opener and had a bit if a gash. Apply the puffy paint straight from the bottle to the top of the cork. Think simple here. There’s no room for complex designs so sketching and planning isn’t necessary. Just squirt out some puffy paint and see where it takes you. Most puffy paint bottles come with a slick little applicator that works perfectly for this purpose. If you need to use a toothpick to spread the paint exactly where you want it. 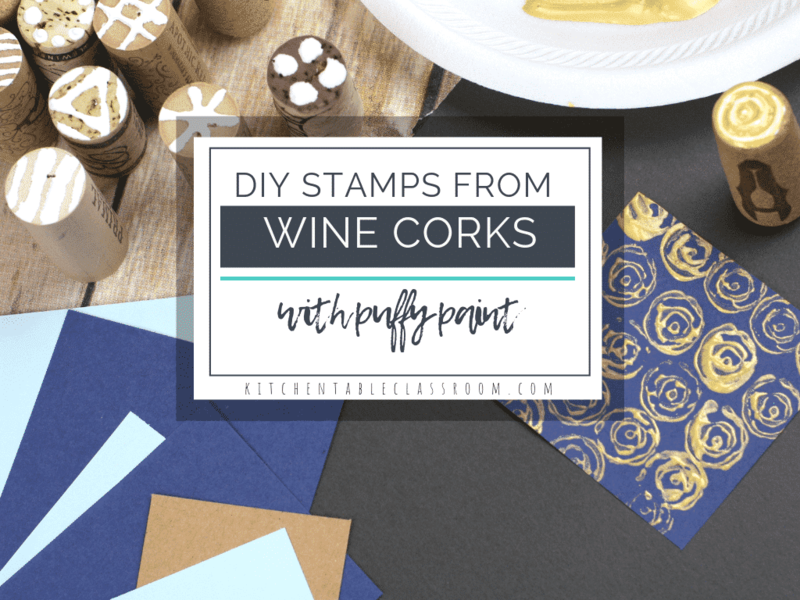 Set the wine cork stamps aside to dry for a few hours or, even better, overnight. Now that your stamps are dry you’re ready to make some designs. I love the simplicity of repeating the same stamp in the same color over and over. But, kids don’t tend to gravitate to simplicity and that’s totally okay. Provides plates with just a bit of paint spread out on them. Dip the homemade stamps into the paint and then onto the paper. Depending on the amount of paint you may be able to squeeze out a few prints before adding more paint! 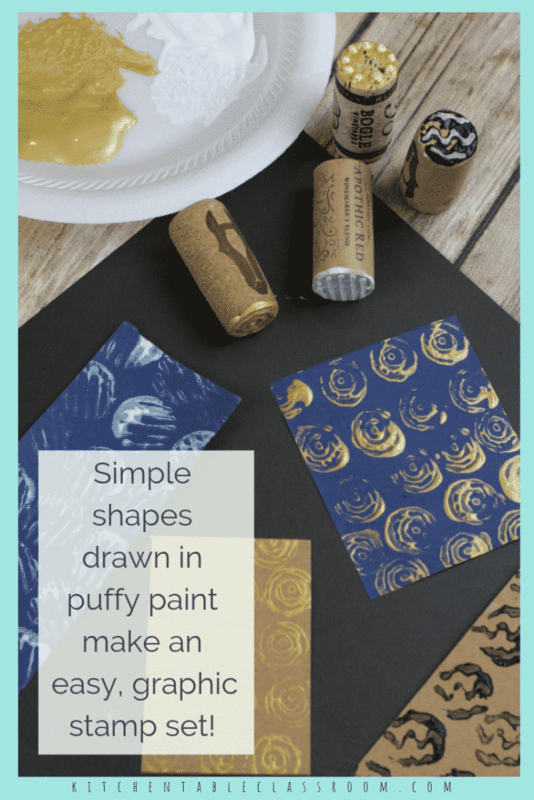 This is a quick and simple process so be sure to provide multiple colors of paper and paint so your kids can experiment. 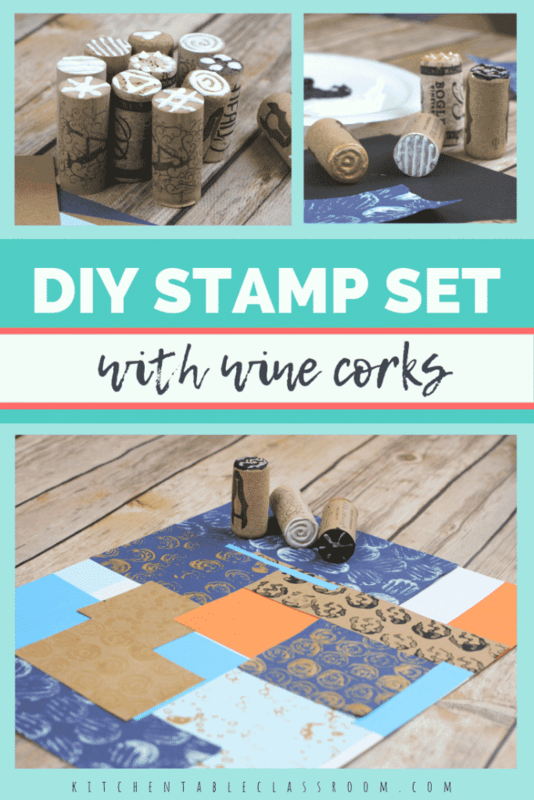 How to display your wine cork stamp prints? These tiny prints would be a natural for decorating homemade wrapping paper or greeting cards. I also love the look of stamping lots of different papers and combining them in a paper quilt kind of way. 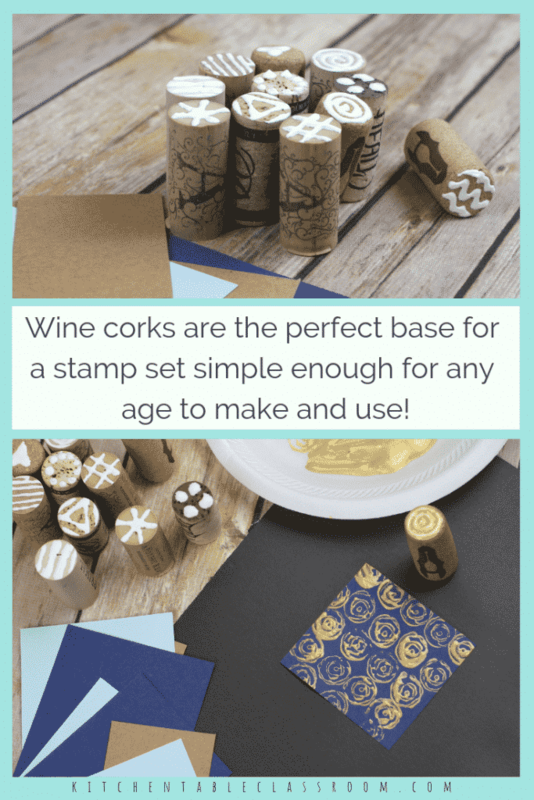 These little wine cork stamps are a fun way to create patterns that could be the beginning of any number of project possibilities! I can’t wait to see what you make! If you love these little wine cork stamps please share any of the above images on your favorite social media channel!